This is a fun skill game in which the balls are having a war against the cubes. You will be of course taking the part of the balls as they can fit in the cannon. The cubes will not know what will hit them, if you do a good job of choosing the right types of cannonballs to shoot them with. The black ones are great for killing multiple units as they explode, the blue ones are the basic ones and there are many other colors that will do well in different situations. 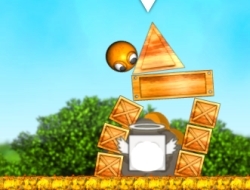 Choose the right angle and enough power to make the cubes regret each end every one of their sharp corners. Have fun taking down their defensive structures and thinning their ranks. Use the mouse to aim and shoot the balls. Cruel Balls 0.00 between 0 and 10 based on 0 votes.